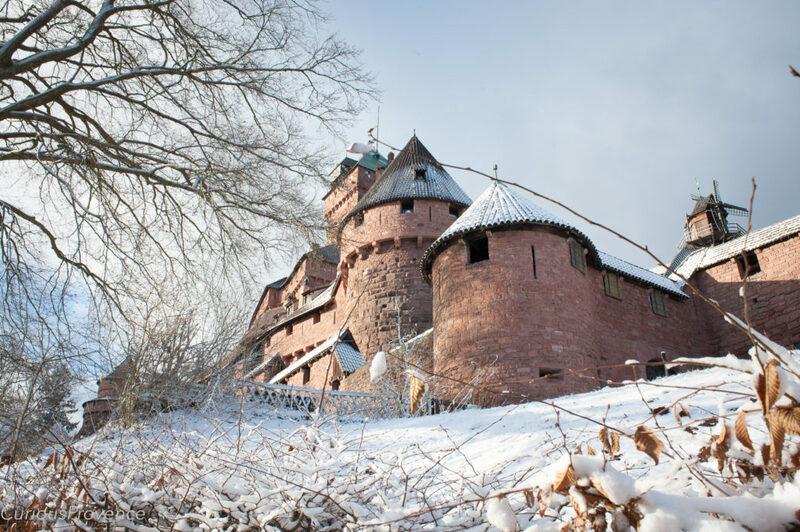 Alsace is a popular destination all year round. The delicious and affordable wine, vineyards that stretch right to the peripheries of charming little towns, colourful architecture and hearty cuisine makes the region irresistible. 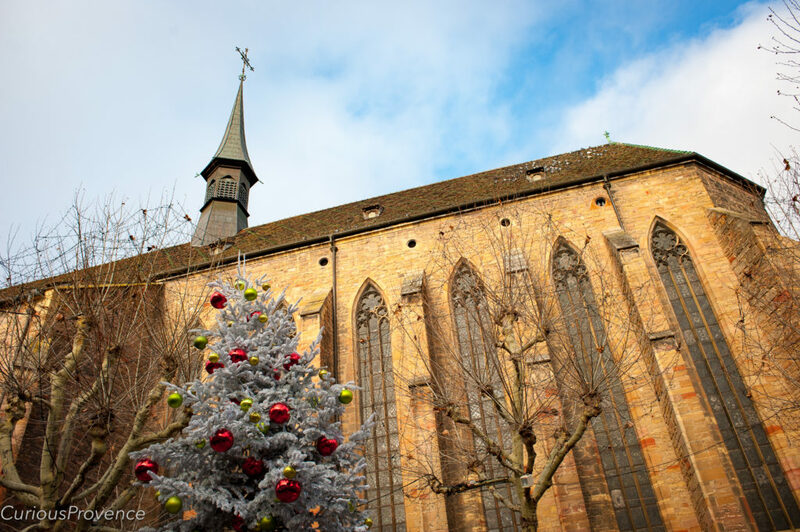 In France, the region is synonymous not only with Gewürztraminer, Pinot Gris and Riesling, but Christmas. Due to the territory changing nationality between France and Germany many times throughout its history, the region has a strong German influence. During the December period, this translates into German-style Christmas markets. 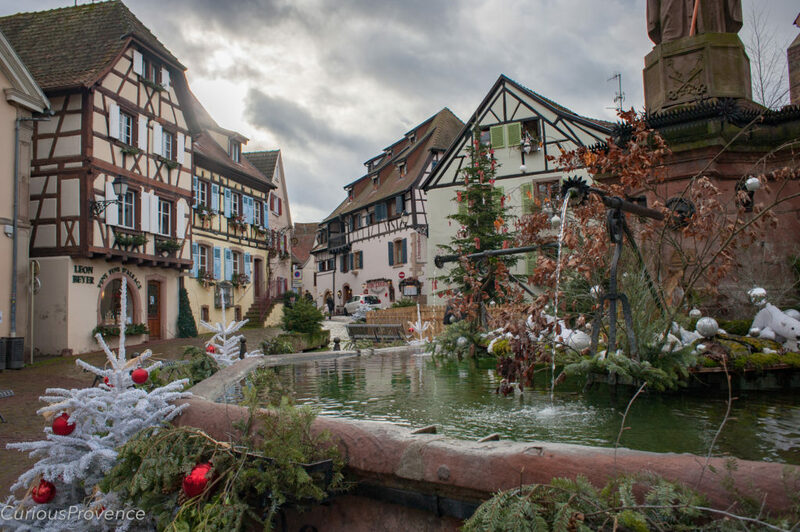 Ever since I moved to France I dreamed of spending a Christmas in Alsace. Last year, my dream came true. 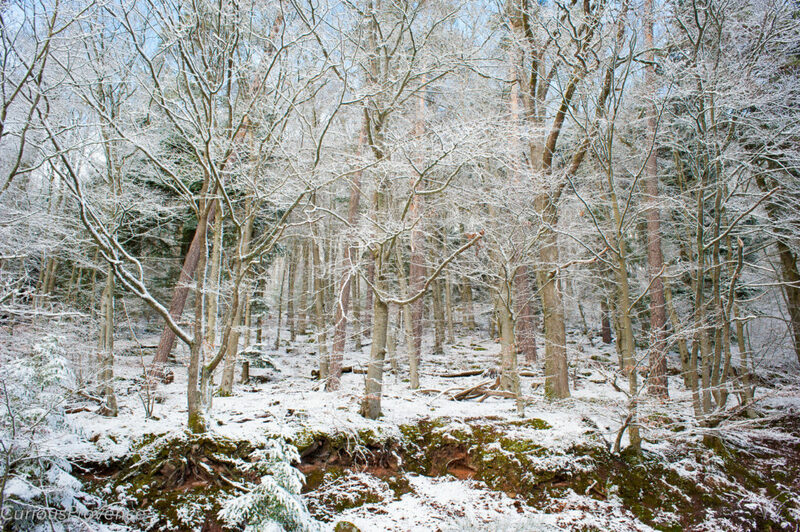 Snow on the road to Haut-Koenigsbourg Castle. 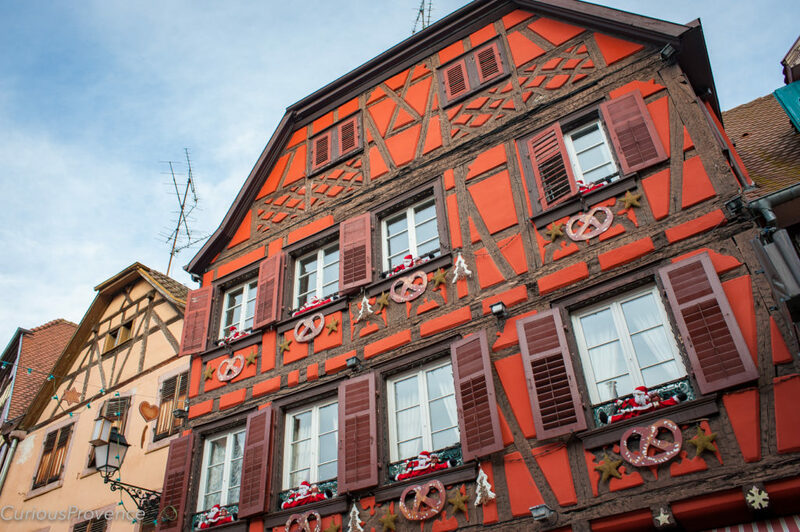 Although Strasbourg is the largest and best known of the Christmas markets, we prefer the smaller towns for wandering. 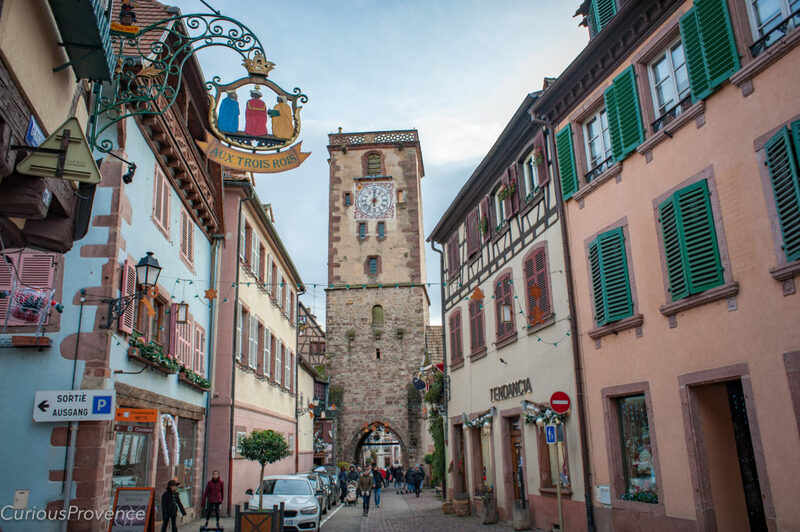 Alsatian towns are indeed as pretty as postcards. 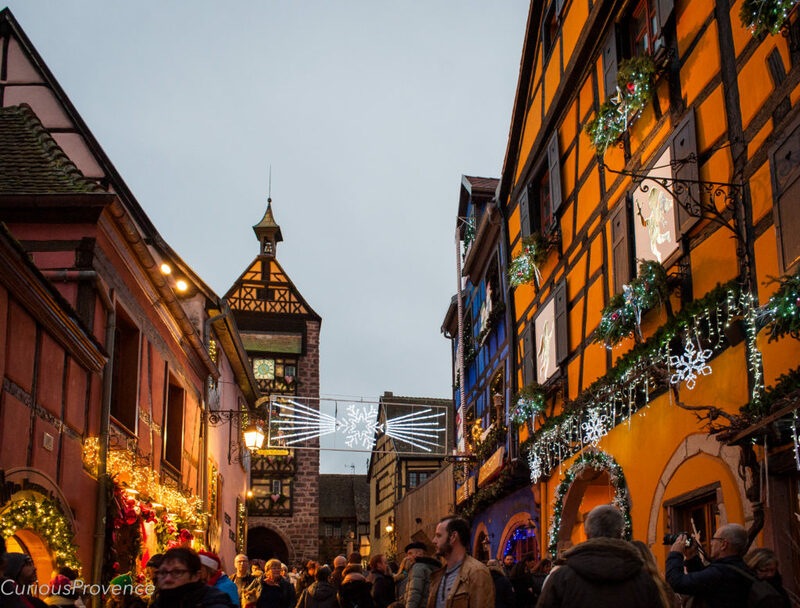 The colourful timber-framed houses and masses of tasteful Christmas decorations truly lend themselves to a magical ambiance, especially in the early evenings. Take advantage of the affordable wine, usually served to the rim in small glasses with green stems. Look out for wrought iron signs with dangling golden grapes above family owned caves. Watch Kouglofs being made at the local bakery. Eat lots and lots of potatoes covered in strong Munster cheese. Notice the impressive stork nests propped up by metal circles on top of churches and public buildings. Visit castles and take long walks in between the miles and miles of grapevines. Visit Alsace. The main street of Riquewihr. 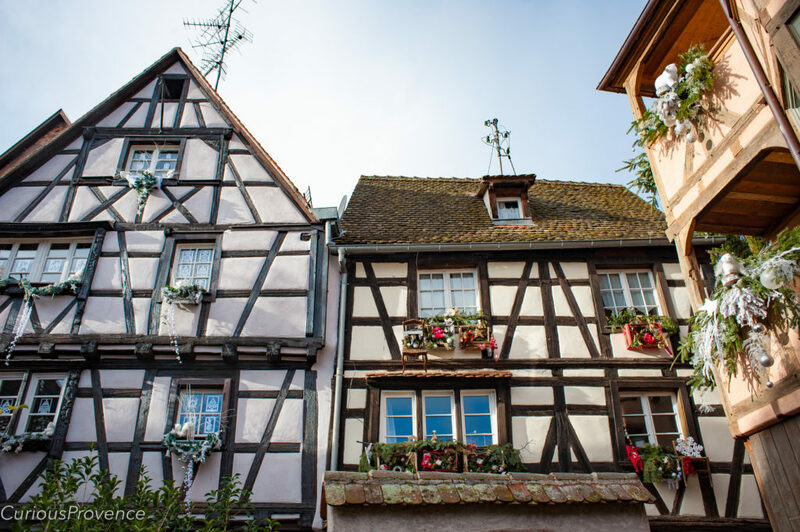 All the villages in this list are dangerous if you love wine but none more so than Riquewihr. This town does indeed get quite busy during the holiday periods but as it’s so pretty, it really doesn’t bother me. 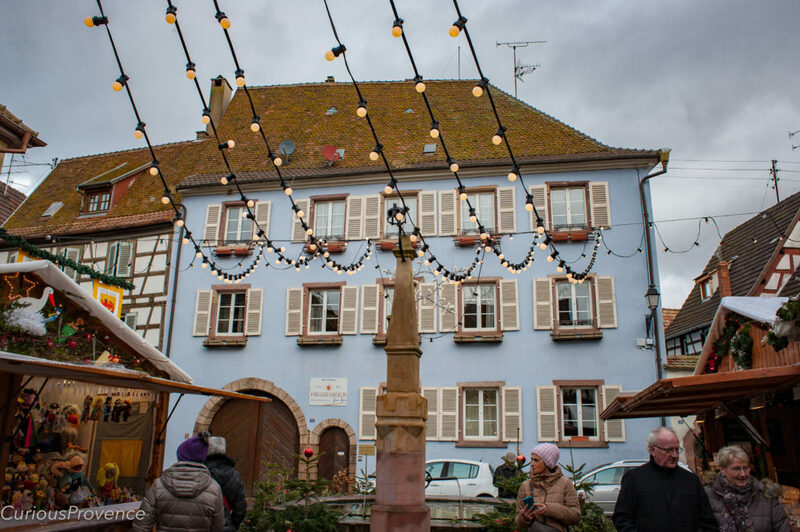 Despite the tourist influx, Riquewihr has stuck to its roots when it comes to wine. All along the main street, you’ll find cave (wine shop) after cave of family-owned vineyards. I dare you to try a glass in all of them! We certainly made a good effort. 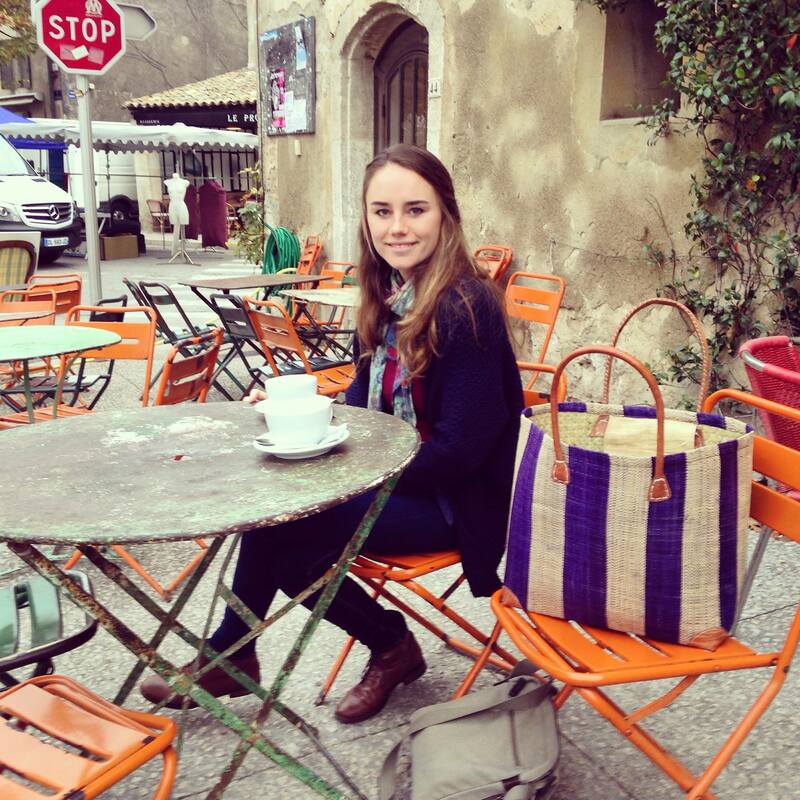 We stayed in one of the Les Remparts de Riquewihr apartments for nine nights. I couldn’t recommend them more. The apartments are cozy, beautifully decorated, equipped with all the necessities, and located right in the centre of town. Check out the site, you’ll fall in love. I don’t think I’ve ever been so happy with the accommodation. I booked in March for Christmas. It’s worth it. Our apartment was the first balcony on the right hand side. Lovely view! Winter vines right on the edge of town. I find it very useful to wine taste in Alsace because there is a tradition of creating vintages with single grape varieties. These vintages are purposefully made to resemble the “true taste” of that grape variety. I love all of the traditional grapes of Alsace. Many of the wines taste sweet if you’re used to drinking dry whites such as chardonnay. The Alsatian Riesling is impressively dry and the Gewurztraminer, beautifully aromatic. 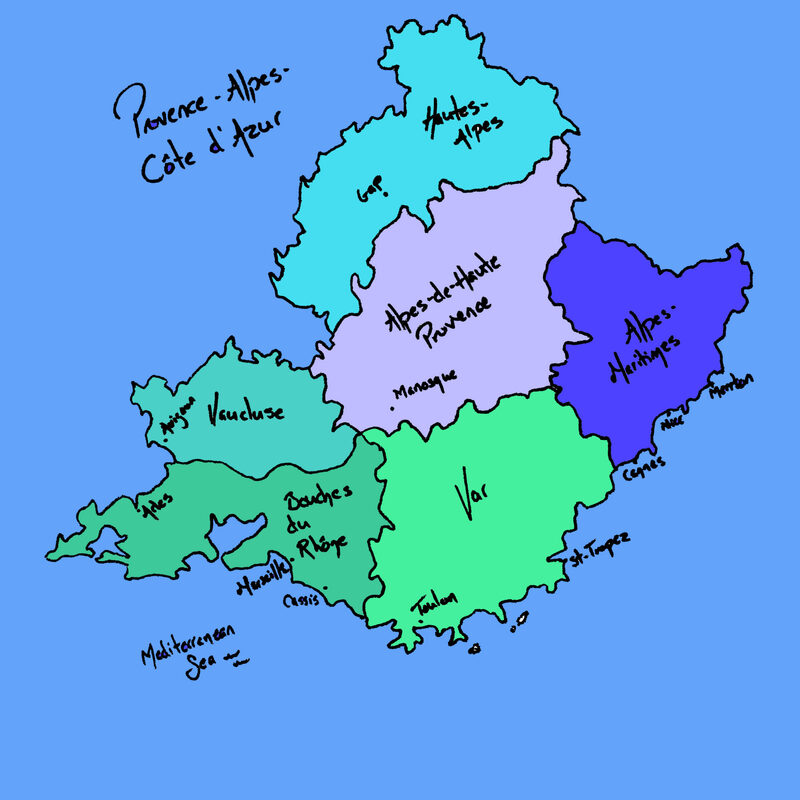 Sylvaner (very easy drinking), Muscat (Muscat is dry in Alsace, unlike most other places where it’s used for sweet wine), Pinot Blanc (often just called Pinot), Pinot Gris (love), Gewurztraminer (pronounced like this), Riesling, Pinot Noir and more! Local vineyards also have their own blends, generally one dry and one sweet. The local red is pinot noir, which is generally very light. 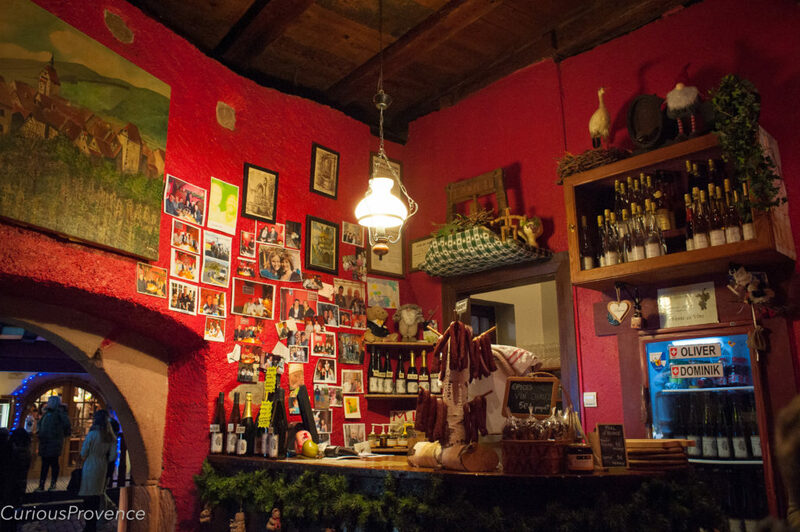 Cozy atmosphere with all you need for a holiday in Alsace- wine and sausages! 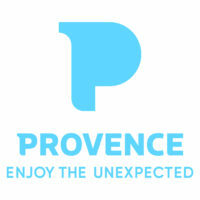 This little wine bar is always full of people, the wine is delicious and a great price. We were here on Christmas eve when the owner had to lock us in because she didn’t want any more customers! The only problem is that in winter there are no heaters so dress warmly. All the caves will allow you to taste, and they’re generally all quite good. 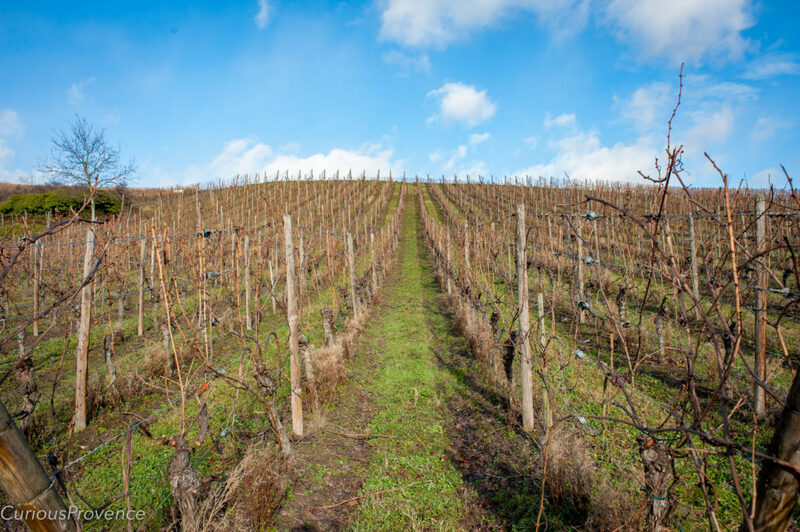 Dopff is one of the largest vineyards but still known for high quality. Ask to try their grand cru wines; they’re quite generous in the number of wines they allow you to taste. 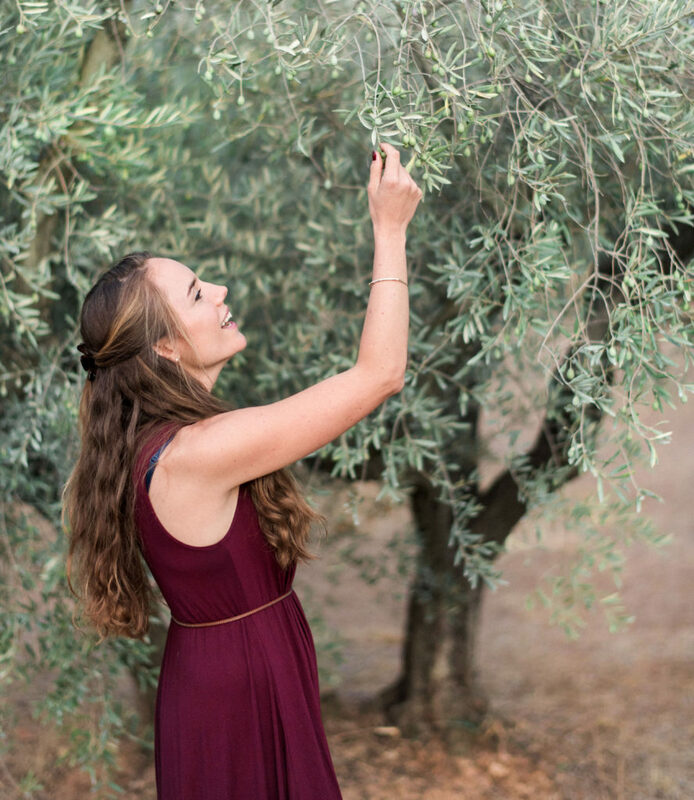 Their wide selection allows you to taste the difference between the same grape, treated in the same way by the same vineyard, but grown a few miles apart. Fascinating. Try the Baeckoffe here. It’s garlicky and delicious. Order the menu with 3 courses here and make sure to try the “Plume d’avocat et cocktail d’écrevisses marinées, espuma de tomate.” It’s a very refined prawn cocktail. Exquisite. 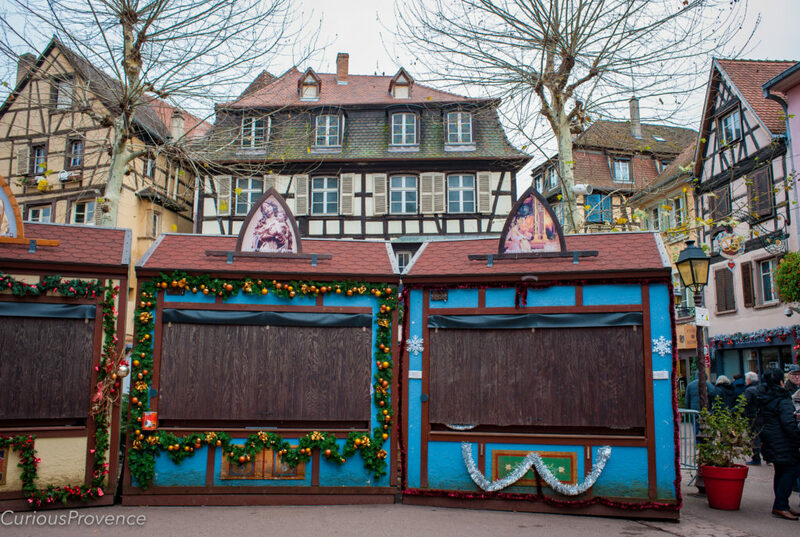 Christmas market on the 25th in Colmar. 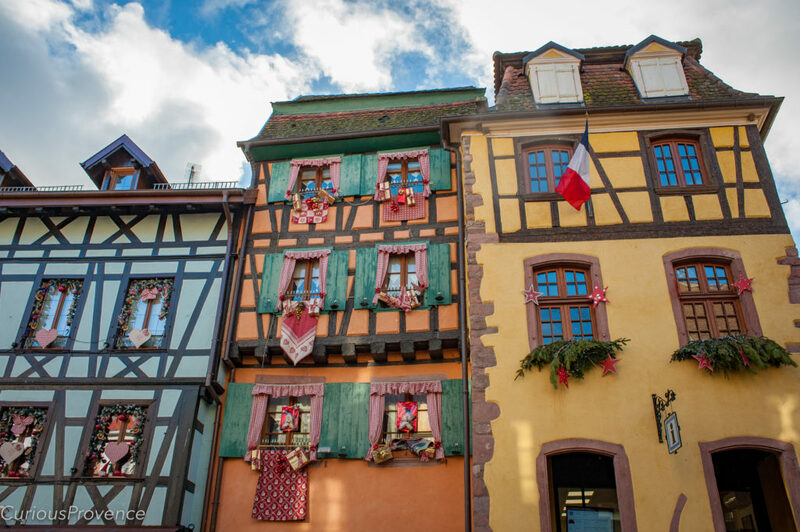 A much larger town than any of the others on this list, Colmar is perfect for a day out. 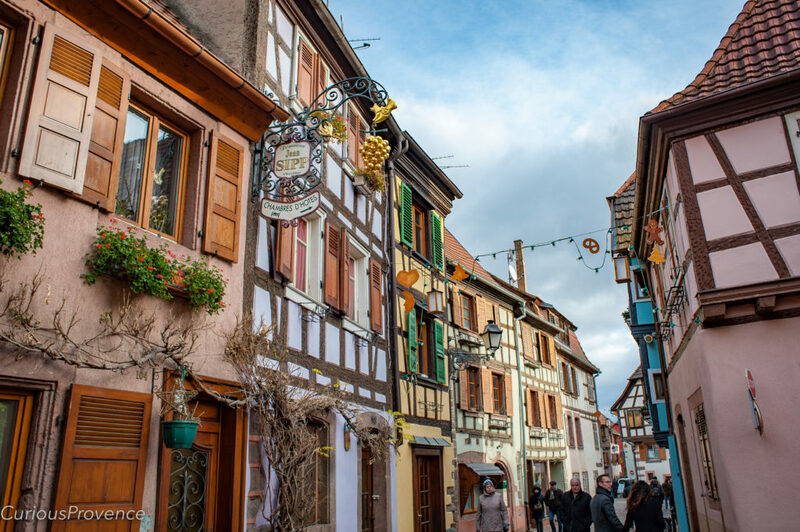 In addition to its fascinating history, Colmar also considers itself to be the “capital of Alsatian wine” (capitale des vins d’Alsace). 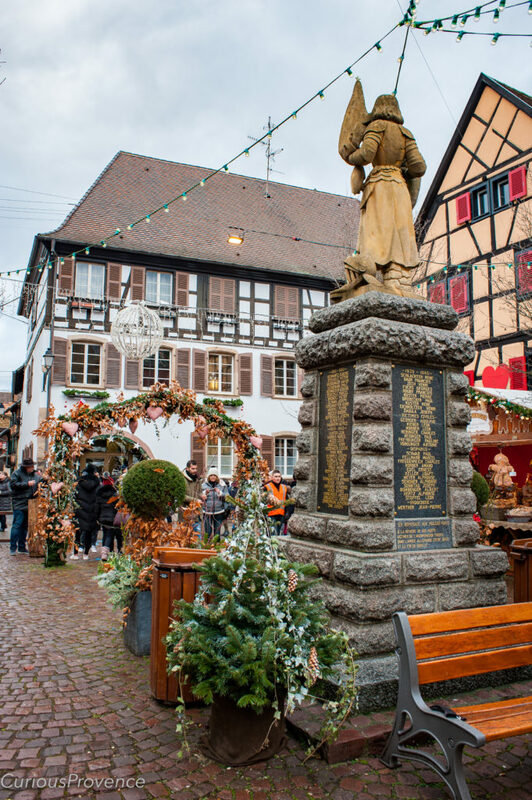 However, we noticed this same title being boasted in many of the towns along the Alsace wine route. 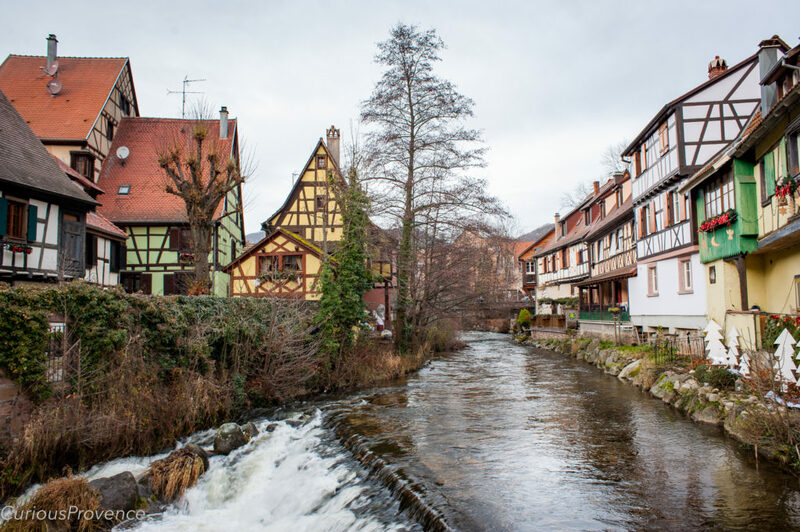 Many of the prettiest villages of Alsace are located, every so perfectly?, on the Alsace Wine Route. Colmar has a well-preserved old town and many museums among which is the Unterlinden Museum, with the well known Isenheim Altarpiece. The religious buildings in Colmar are so beautiful that you may find yourself wondering which is the cathedral. I love the warm tones of the local stone. I would suggest participating in a walking tour by a local. 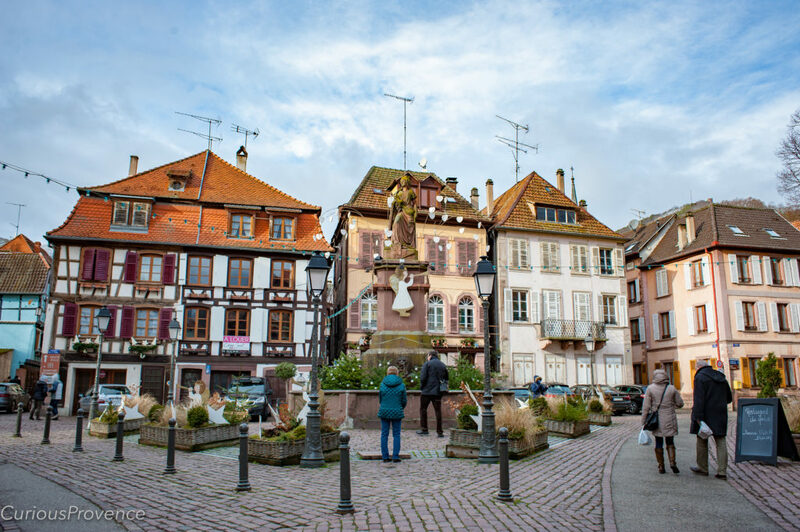 Normally, the tourist office tours are great value for money and informative but I would suggest choosing a more specialized company in Colmar. The tourist office tours are few and far between and the one we went on was in French and German. This made it twice as long as we’d hoped! Either way, it’s a great way to learn some history of the town while getting your bearings. 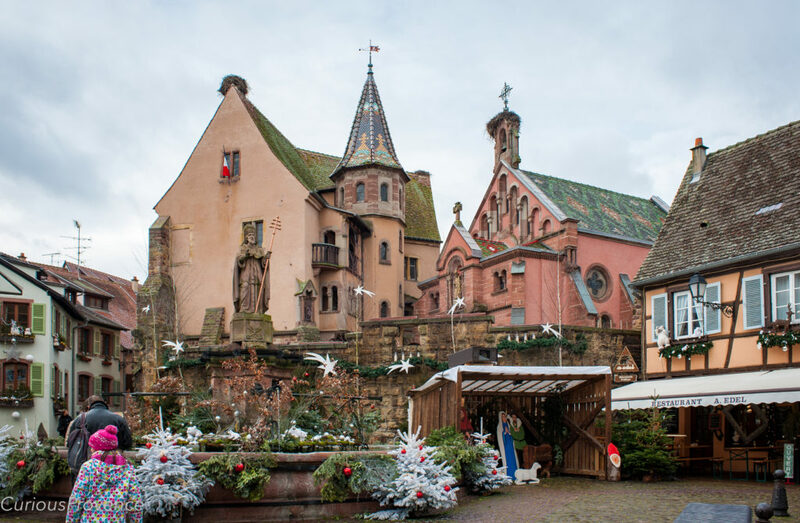 There are 5 Christmas markets dotted throughout the old town of Colmar. Despite the fact that online it says they’re open during the Christmas to New Year period, this is only true for a few of the stalls. 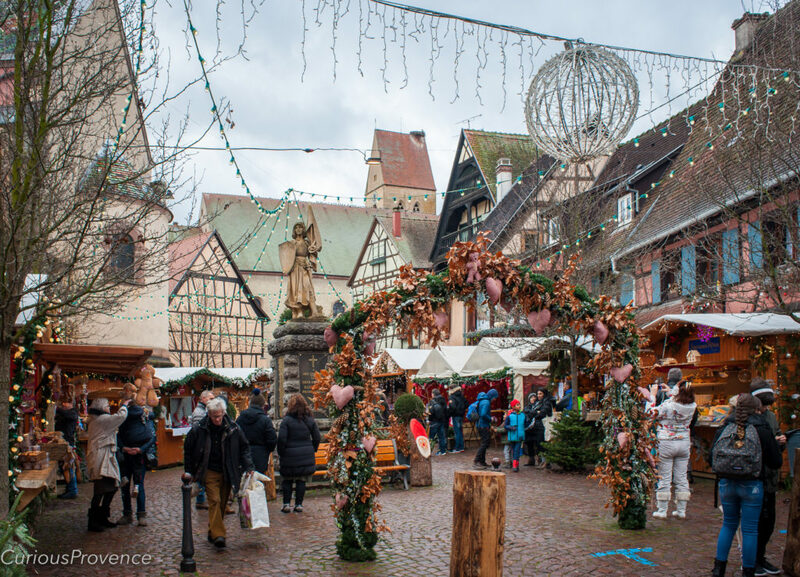 If you come to Alsace for the Christmas markets, the three weeks before Christmas are best. 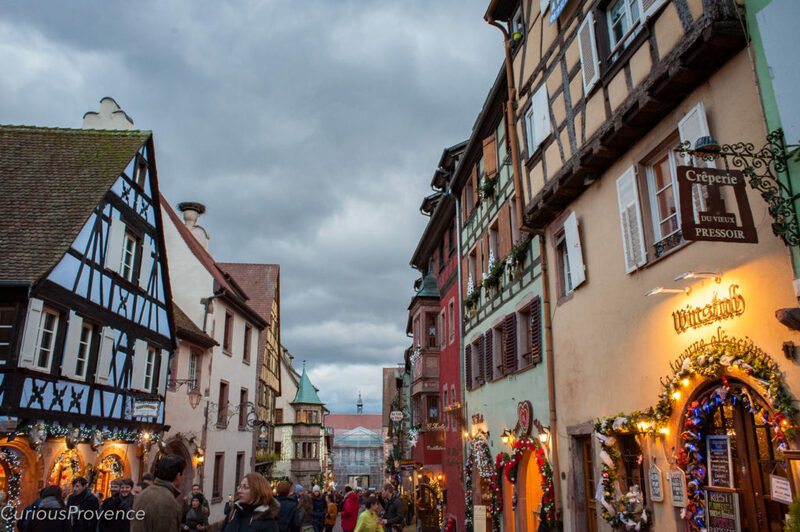 The covered, extensive, everyday market located on “Le Petit Venise” of Colmar is fun for scouting out local ingredients and having a glass of wine within the bustling atmosphere. 13 rue des Ecoles (Centre Historique, Petite Venise) 68000 Colmar. Jean Jacques Waltz, or Hansi, was an illustrator born in Colmar in 1873. 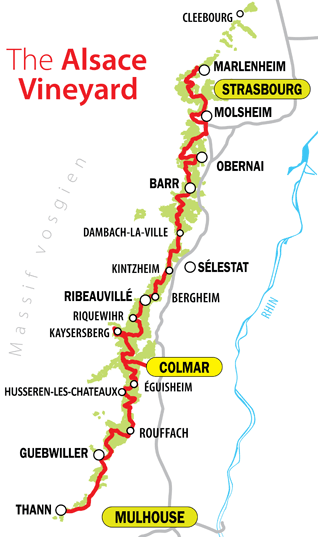 The area of Alsace became German territory in 1871, one of the many times the area has switched nationality. 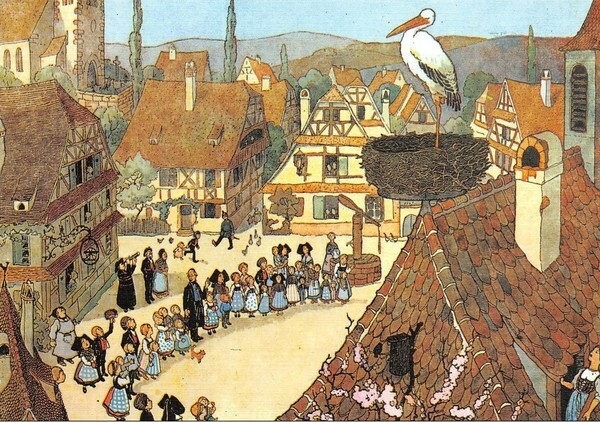 Hansi is responsible for the romantic depiction of Alsatian villages in watercolours as well as engravings. He’s responsible for many of the unique signs still hanging above buildings in Colmar indicating pharmacies, bakeries etc. 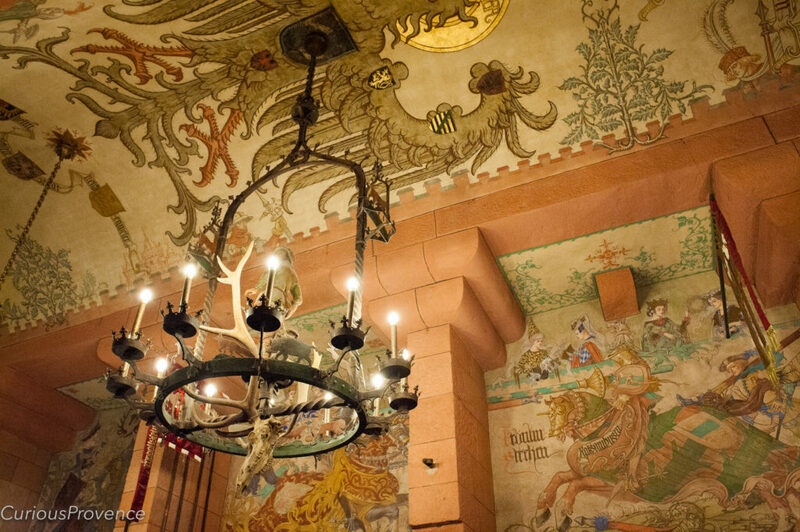 As the culture of Alsace is so entwined with that of Germany, national pride was an uneasy topic. Hansi created his signs unapologetically in favour of French Alsace. He suggestively used le tricolor or red white and blue of the French flag in his designs. Visit the museum and buy something in the shop for a souvenir of the region. 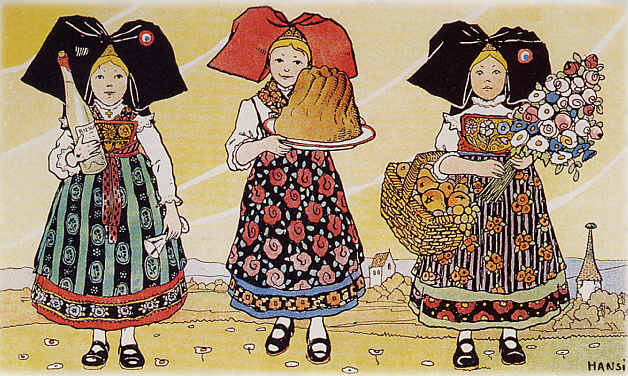 Hansi illustrations depict pride in Alsace culture and tradition. If you like organic, biodynamic, or natural wine, poke your head into La Sommelière, a beautiful wine shop located in the Cathedral square. My man is a big fan of this type of wine and he was like a kid in a candy shop! Keep your eyes open as you’re wandering Colmar for the numerous vintage bookshops. Spend an hour rifling through old military maps, 1920s editions of illustrated Larousse encyclopedias and various accounts of the life of Napolean. 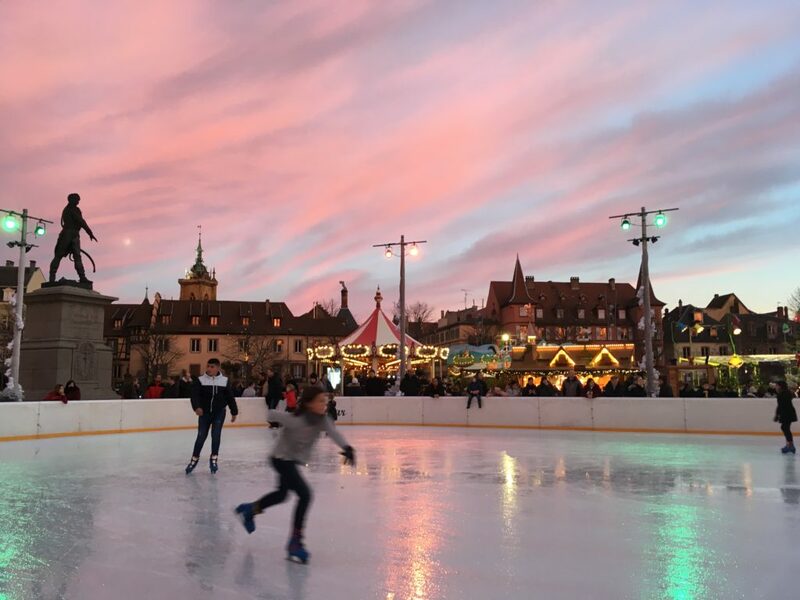 Skating on New Years Eve in Colmar. During the month of December, take advantage of the skating rink. The rink claims to be open from September to June. I’m a little skeptical. Can someone confirm? It only costs 4,50€ or 6€with rental skates. Wander the streets of this lovely town, check out the Christmas market, and marvel at the imperial castle ruins that dominate the town. We noticed some of the best bakeries here. From the 13th century fortress, walk 10 minutes to the viewing point where you’ll find an expansive view of the valley. Grapevines for miles! If you go to Kaysersberg, I will not forgive you if you don’t eat at Le Chambard. This boutique hotel and spa has a 2-star Michelin restaurant. But I’m talking about the adjacent Winstub. A Winstub is an Alsatian traditional restaurant. Think red checkered tablecloths. However, this Winstub, obviously influenced by the Michelin star restaurant next door, has incredible quality food. DELICIOUS. *If you like natural wine, or would like to try something new, order a bottle of Vignoble de Rêveur. 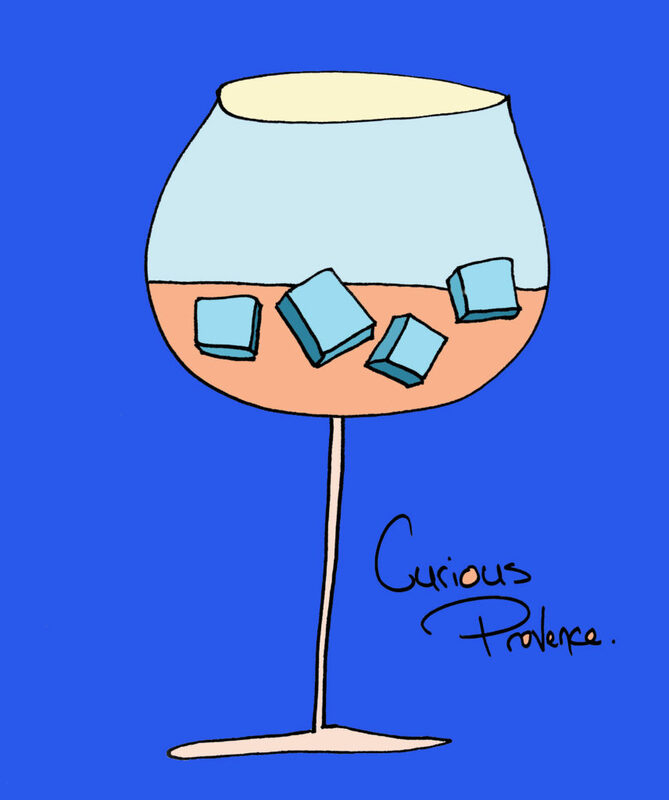 It’s on the wine list under the title “curiosities.” We liked it so much that we managed to quaff 2 bottles of it…! I have about 20 pictures of this clock tower in Ribeauvillé. Absolutely love it. This town is not often honoured as one of the prettiest villages of Alsace but we quite liked it. The long main street is full of pretty boutiques and this is the start of quite a few walking trails. Look up towards the mountain where you might see the 3 chateaux covered in snow. 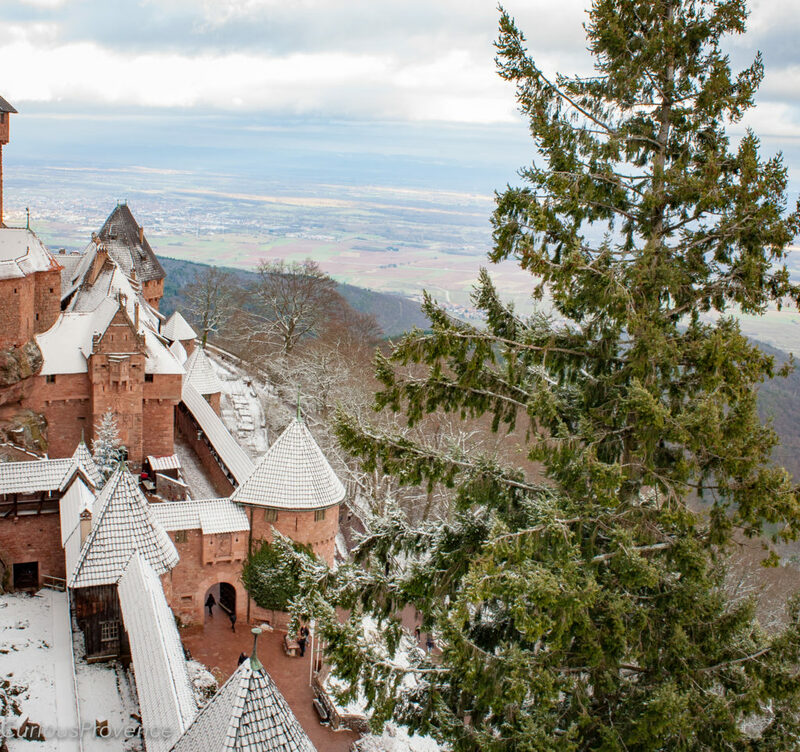 Haut-Koenigsbourg Castle is about a 20-minute drive from Ribeauvillé. 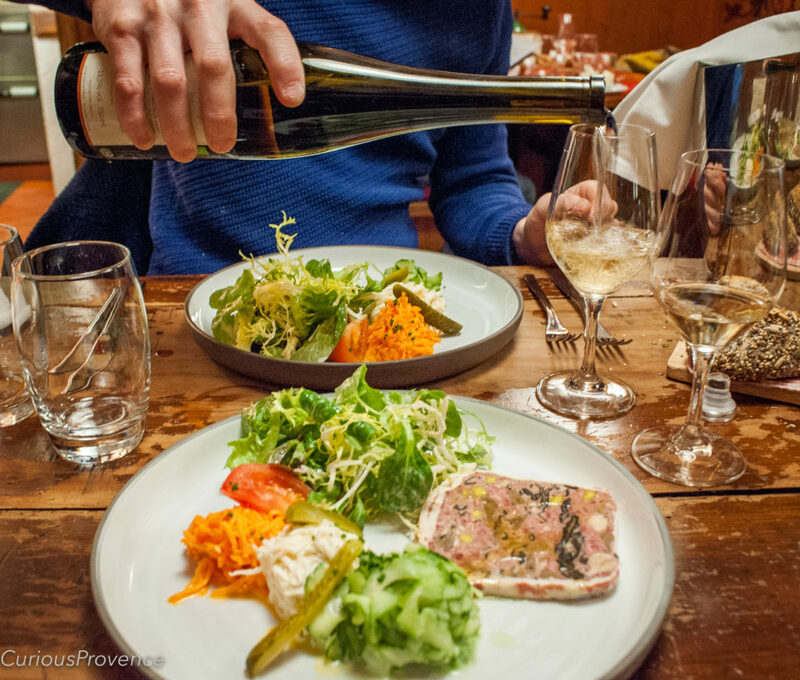 Wonderful quality house-made Alsace specialties. With dried grapes hanging from the ceiling and checkered table cloths, this cozy restaurant fills up quickly. We ate Coquelet au Riesling and Biche. The local next to us was raving about the choucroute. You know it’s good when the locals are raving about the cabbage! 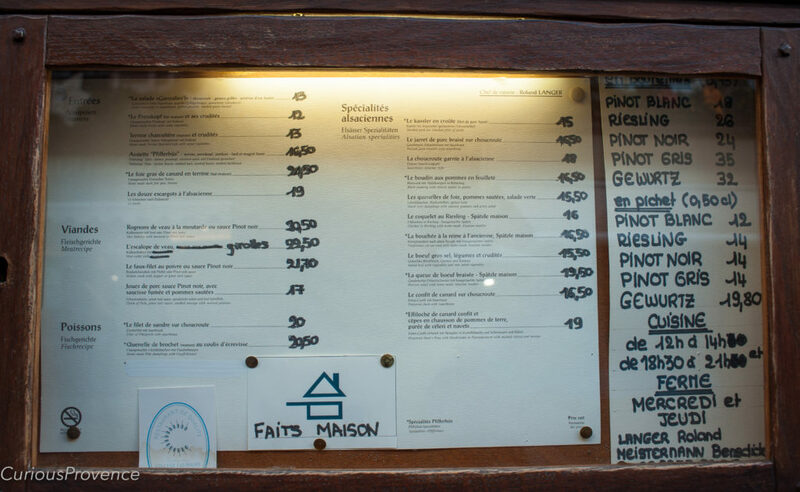 Look for the icon “faits maison” (guaranteed made in house) a rectangle with a triangle on top. We plurged on a bottle of Grand Cru Altenberg de Bergheim and let’s just say it was so delicious I drank it like water! There’s an App for the region called VisoRando that you can download. This is probably the prettiest Christmas market in all the little towns we visited. Known for it’s beauty, this town is quite touristy but also fantastic if you need to stock up on some wine. It has been ranked as one of the Most Beautiful Villages of France since 2003. 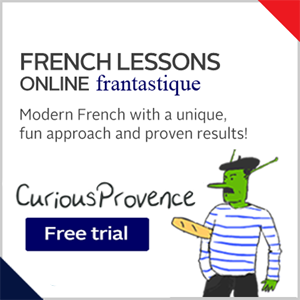 I found lots of local tips and advice on this blog: Mon Weekend en Alsace (in French and English). Have you been to any of these villages? Do you have a favourite? I am so excited to see your beautiful photos of these villages!!! We stayed in two of those apartments in Riquewihr many years ago and loved it!!!! Kaysersberg was probably my favorite village, but I loved them all. Great restaurant suggestions for next time!